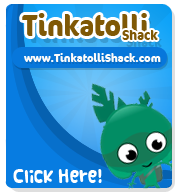 Tinkatolli Tips - Tinkatolli News & Tinkatolli Guides 2013: New TinkaTolli Bag & Minor Chat Log Updates! The old little bag has been replaced with a better and faster design. You can also drag the bag everywhere you want! Now, everytime you go to the Dirty Dozen the Junk is automatically ordered so the junk with the biggest amount you have it is at the top of the bag for an easier trade! Just a little border that shows you can move it! I like these updates! What do you think about them?